We are a leading salon located in Bordesley Green, Birmingham. Come and relax in the hands of our professional stylists and therapists and let yourself drift away from the daily grind of the day. 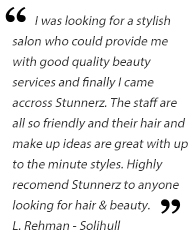 We want you to look and feel good with great inspirational ideas we will ensure that every visit to Stunnerz leaves you feeling radiant and revitalised. Our team of talented Stylists and Professional Beauty Therapists will provide you with highly Professional Hair and beauty treatments for any occasion. Here at Stunnerz we are renowned for our WOW BROWS! Our expert team will make your brows exactly as you like them whether it be HD Brows or Natural. Our dedicated Bridal team will transform your bridal party to perfection ready for your big day. We provide you with a private room for you and your party to prepare in. Our talented team will dote on your every need to make sure you all look amazing.